Today I started writing Finding Faith, the sequel to Saving Grace. Trying to merge a writing career with a full-time college schedule, plus family and household responsibilities has proven to be more of a challenge than I'd thought. Still, I'm determined that it CAN be done. And, for today anyway, I'm elated to have defeated the "blank page" and finally have clocked out the day with a little over 1200 words. Not bad when you consider that I would stare at the blank opened page in Word for a while, then browse some of my favorite blogs, then go back to pondering the blank page, then surf a few scrapbooking sites. I know, I know...I was bitten in a large way by a very mean, very determined procrastination "bug." I don't know why the beginning of a story frightens me so. The intimidation fills me with fear and this overwhelming feeling of "I'll never be able to do this again!" I admire writers who love the beginning processes. Me, I'm more of a middle-story gal. I like the smooth-flowing continuity of characters and plot-lines. I feel safe there, and in control. But the beginnings and the endings...wow, they can really knock me for a loop. Anyway, I'm going to try to hold myself accountable to you, my readers and my friends, by logging my word count once a week. That way, you can see the progress I'm making and also the mood I'm currently in concerning the story. Let me tell you though - the moods can vary from "Gee, I love this writing life!" all the way to "I wanna drop-kick this computer right out the back door!" So...if you're brave (and don't live right outside my back door) then you're cordially invited to help hold me accountable to this story. This tracking meter is set to 50,000 words but the book will actually have closer to 90K. So my initial excitement at seeing that I'm 2% there (!) was a bit premature. For now, I'm going to put on my shoes and go out for a celebratory Sonic Diet Coke. I conquered the blank page and if that doesn't call for my all-time favorite crushed ice and beverage of choice, then I surely don't know what does! Many days I go for hours at a time without any verbal communication. From the time I sit down at my desk with a steaming mug of coffee around 8:30 a.m. until I finally tie up loose ends around 3, I am alone. I've listened to Ella and to Luke, to Jackson and to Emma...Now, most days, I listen to Dottie and her crazy friends, Camille and Rachel, as they strive to find balanced lives in my new Mom-Lit series, MomCents: just say no! I'm looking to do a blog tour for my new novel, Saving Grace, which just released. Here's thirteen easy steps showing you exactly how you can be a part! 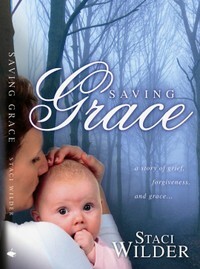 Saving Grace is my brand-new inspirational novel, just released two weeks ago. The story deals with grief, forgiveness, and grace. then I will send you your very own free copy. Feel free to keep it for yourself, or give it to one of your readers, or to a friend. If you are interested, simply email me (my email link is in the right-hand sidebar) and/or leave a comment. and a pre-written article about the book. This a great way to get a brand-new free book while, at the same time, introducing your friends and family to great inspirational fiction. And...you'd be helping me out tremendously as I promote Saving Grace! Thirty-four-year-old Grace Davenport's childhood memories are less than idyllic. Raised by an alcoholic mother, Grace learned to fend for herself in the midst of chaos. Her sixteenth summer shattered her innocence, plunging her headfirst into a nightmare that followed her into adulthood. Determined to put the painful past far behind her, Grace picks up the broken pieces of her heart and forges a future, finding love along the way. Finally the pain is vanquished, a dim memory of a life she once knew. That is, until the day the phone rings and Grace hears the one voice she'd never expected to hear again. Suddenly the terror of that fateful summer is back, and Grace is face to face with the haunted memories she thought she'd laid to rest. A few weeks ago I received a book in the mail that totally captivated me. Coldwater Revival, by Nancy Jo Jenkins, a fellow ACFWer. Nancy's debut novel is full of southern charm and laced with whimsical lyricism that captures your heart on the very first page and doesn't release it until the last paragraph fades from your memory. If you'd like to win a copy of this book for yourself, please leave a comment for me and you'll be automatically entered into a drawing that will take place on August 18th. I’m a southern girl, born in Texas and have lived here all my life. I come from a large family. My daddy’s parents had fifteen children, thirteen of whom lived to adulthood. There were seven sons and six daughters. A baker’s dozen, so to speak. My grandparents sent all seven sons – plus one grandson – off to fight in World War II. All returned safely, though my dad suffered back injuries when his ship was attacked in the South Pacific. Our annual family reunions usually pack in around two-hundred and fifty attendees. Family has remained a strong influence in my life. Perhaps it was my family background that precipitated the writing of Coldwater Revival. I remember many get-togethers where love and laughter flowed like honey, but where there was sometimes a bit of “scrapping” going on, as well. Maybe it was during one of those rowdy gatherings that the seed of Coldwater Revival was planted in my heart. I taught grade school (special education and second grade) for twenty-one years, and I absolutely loved working with children. Now I have beautiful grandchildren to dote on. But during the last ten years of teaching, I dreamed of the day I could write the stories that God had placed in my heart. Coldwater Revival is one of those stories. The Falins are a farming family who lived in rural Texas in the 1920’s and 30’s. Emma Grace’s story is one of love, tragic loss, forgiveness, and survival. Q. How long did it take you to write Coldwater Revival? A. I perceived the idea for Coldwater Revival in June, 2003, and completed the manuscript in March, 2005. Q. Tell us about your journey from writer to published novelist. A. During my teaching career, I dreamed of the day when I could write the stories that continually swam around in my head. I didn't know at the time that it would take me four or five years of attending workshops, conferences, retreats, lectures, and of studying tapes, books and other materials before I was ready to put my newly-acquired knowledge to use, and begin writing the stories that God had prompted me to write. In March, 2004, at the Mount Hermon Christian Writing Conference, I submitted a book proposal to Steve Laube (Literary agent), and Jeff Dunn, (Acquisitions Editor) for RiverOak. Both gentlemen asked me to send them all I had written on Coldwater Revival, which at the time was 109 pages. During the summer of 2004, both men offered me a contract. My book was published by RiverOak and released in May, 2006.
experiences did you draw from to portray Emma Grace's feelings so well? A. There was a time in my life when I suffered with depression, though it was not due to a death in the family, as Emma Grace's was. At the time, it seemed that I was in a daily knock-down, drag-out fistfight with sadness. I was truly blessed in that I was never prescribed any kind of medication to treat my depression, which proved to be relatively short-lived. But I did receive counseling, which was just what I needed to win the battle with this debilitating condition. During that time of depression I endured many of the symptoms that Emma Grace suffered through. Excessive sleeping was about the only symptom we did not share. There were times when I couldn't swallow my food, and times when I could almost touch the face of that same blackness that almost overwhelmed Emma Grace. Her sorrow and guilt were difficult scenes for me to write, and I found myself crying each time I wrote about Emma Grace's sadness and the continual ache in her heart. Q. Emma Grace loses all desire for life when her brother dies - not eating or talking, just living in the blissful cocoon of sleep. Do you have any advice for folks who are in that dark place right now? A. Communication was the key that unlocked the door of depression for me. Communicate with God, even if the only words you can utter are the words, "Help me." But I also benefited greatly from talking to a certified counselor; one who was trained in helping people express their pain, their needs, their fears. I hope that anyone who feels sad and lonely for an extended length of time, will contact their pastor, or someone who can direct them to a Christian counselor. Q. Emma Grace's grandmother lives in the city while the rest of the family lives in the country. Why do you think she didn't move out to the country with the rest of the family long ago? A. Granny Falin immigrated from Ireland to America with her husband and son when Emma Grace's papa was just a lad. This family shared a dream about their new country. It would be a place where they could find work and prosperity, raise their family, and put down roots. Even the Great Hurricane of 1900 couldn't wash those dreams from Granny's heart. Though her only remaining child lived a hundred miles away in the rural township of Coldwater, Texas, Granny could never leave Galveston. The island and the sea that surrounded the island were her home now. It was where the ashes of her husband and three children were buried. It was the home she and her husband had dreamed of during their desperate years together in Ireland. If she left Galveston and moved to Roan's home, she would be giving up the dream she had shared with her husband. Q. Papa and Elo have a tough time showing their emotions. Elo, especially, is so hard to read in the book. Why do you think some people hole up inside themselves rather than sharing their emotions? A. I believe we are born with a portion of our personality already deeply embedded within us. Some people are reticent to express their feelings and emotions, while others have no problem whatsoever in expressing what they feel or think. I have known many individuals who are like Elo; people we sometimes refer to as "the strong, silent type". Papa and Elo are powerful protectors and providers who waste little time and effort on words. Both of these men feel that "actions speak louder than words". Added to that is the fact that Elo feels extreme discomfort when his mother and sisters are emotionally distraught, therefore, he maintains a rigid demeanor, in part, to provide a stable link in the chain that makes up his family - The Falins. Q. Do you have other books coming out soon? A. Thank you for asking about my upcoming books. I'm about to submit my proposal for a novel entitileld, "Whisper Mountain". This story takes place in the early 1900's in the Great Smoky Mountains. It is the story about lost love, and a desperate woman's journey to fill the void that deprivation and loss have left in her heart. The story has elements of mystery, intrigue, murder, and of course, romance. I'm very excited about this story. I've also begun writing a sequel to "Coldwater Revival" which will parallel both Emma Grace's life after 1933, and the adventurous trek Elo begins when he falls in love. I haven't heard from her in a couple of weeks. It's probably my fault. I've been so preoccupied working on upcoming scripts for The Next Chapter, trying to get my team in place for Relay for Life, and reading more for pleasure than for work that...well, I've lost track of her. Before I come across sounding like a blase mother or an unconcerned friend, let me explain. Ella Paglia is the heroine in my latest WIP. We've grown quite close and I know her story well. At least, I thought I did! I'm having a few doubts this morning, but I've been through this enough by now to know she'll show up again. And, if experience is the best teacher, I know that the less I stress, the quicker she'll be back. And I don't want to "miss" her too much right now, because I know she'll still be a part of my family (kind of like a close cousin or a best friend from way back-come-to-visit) long after THE END is typed. The manuscript will get edited, sent to my agent, and begin making the rounds to various publishers and...Ella, Luke, and Reggie -- well, they'll still be hanging around our house. It was that way with Gwen and Henry. And Grace and Kyle. (Although Grace had a *legal* name change and now goes by Ava!) And, most recently, we've continued to have visits from Emma and Jackson. If you're wondering what I mean by this, or if I've gone totally off my rocker, the facts are that my family gets involved with these characters too! Sometimes we'll be sitting in a restaurant and Mike will nudge me, "Hey," he whispers, "Henry and Gwen just walked in!" And, sure enough, there's an elderly couple who resemble our beloved Freemans enough to be their living, breathing twins! So cool when that happens. So I'm not too worried about Ella. I know she'll be back and, together, we'll tell her story. She's a lot like me in several ways and there's a certain vulnerability in that. I'm sure that on some days, it's just plain easier to work on scripts or read another chapter in Angela Hunt's THE NOTE than it is to delve into Ella's life. But it's a story to be told. By me. So, for today, I'll work alone, trying to recall the details, the quirks, the nuances that will lend this story a stable foundation. And, when Ella returns again, I'll have the essence that will breathe life into a story I want to be told.